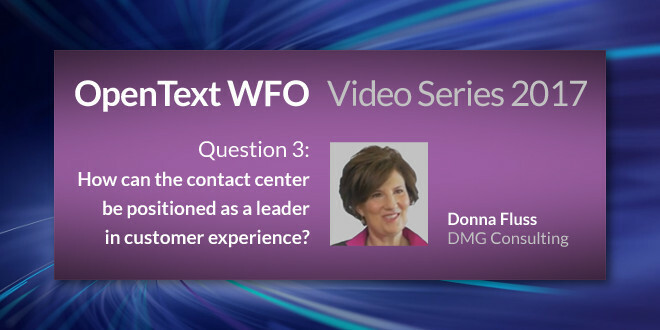 OpenText™ "WFO Video Series: How can the contact center be positioned as a leader in customer experience?" - Open Text Web Solutions Usergroup e.V. OpenText™ "WFO Video Series: How can the contact center be positioned as a leader in customer experience?" So why do I quote Yoda when thinking about this third question posed to our distinguished panel of WFO (workforce optimization) analysts and practitioners for the OpenText™ WFO 2017 Video Series? Well, let me explain with a real-world example. I recently spoke with an executive from a 100-plus-year-old product- and services-based organization that has transformed itself from being an inbound, order taking, issue resolution company to one that now thrives with an outbound contact center which generates over 95% of the company’s total revenues. Think about this for a moment and imagine that your primary product is declining in usage due competition from other more cost-effective options. Consumers still use your product but at a much reduced rate. To reverse this trend, your overall go to market strategy must change. Yes, your consumers know you have other offerings that could be of value to them, but your business model needs to radically change to leverage the feedback and promote an end-to-end supply and service model. Yet cultural and infrastructure transformations of this magnitude are not easily undertaken.